Milestone: Happy 10th Birthday YouTube! Almost 10 years ago to the day, three former PayPal employees started a video-sharing site called YouTube. Little did they know that one day youtube would revolutionise the way we live our lives, offering a platform for communication, education, information, news and most importantly laughter. Founders Chad Hurley, Steve Chen and Jawed Karim were looking for an easy way to share videos, not necessarily a place to sit back and let others watch them. At a time when video files were large and online storage capabilities for them were scarce, youtube’s initial popularity wasn’t so much for its videos, rather as a storage platform that allowed users the ability to store files online, in the same light as Dropbox operates today. So what was the first ever youtube video? 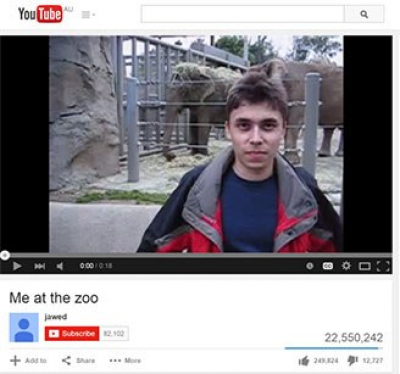 Co-founder Jawed Karim filmed a private test of the fledgling service's capabilities, posting a short video of himself at the San Diego Zoo. The 19-second clip shows Karim unenthusiastically noting how elephants have really long, um, trunks. That's pretty much all he had to say... oh and keep an ear out for the goat. • YouTube attracts more than 1 billion users a month. • YouTube is localised in 75 countries and available in 61 languages. • Half of YouTube views are now viewed on mobile devices, with that number growing rapidly. • The number of hours people are watching on YouTube each month is up 50% year over year. • 300 hours of video are uploaded to YouTube every minute, that’s 12.5 days worth of viewing content. So we come down to the good stuff… 10 years and the 10 most viral videos of all time. Check it out here.